To the best of my knowledge, Imogen Cooper has come only recently to directing as well as playing concertos. In October last year I heard her at the QEH with the Northern Sinfonia in Beethoven – her playing was as fresh and spontaneous as always. Here she is, on record, in Mozart, a composer clearly very close to her heart. It is actually the 23rd concerto that we hear first on the disc. The opening is very serene, very unhurried, even slightly Romantic in feel. Maybe one should really start listening with K291 as K488 is almost too comfortable. That said, there are some nicely sprung rhythms later on and the cadenza is simply tremendous, exhibiting real depth. Throughout there is a chamber music feel to it all, the give-and-take between piano and - in particular - winds a joy. The famous F sharp minor slow movement begins with a piano rumination that had me in mind of Daniel Barenboim's early version of this work from his cycle of the 1960s and 1970s with the English Chamber Orchestra. Indeed, all credit to the Northern Sinfonia for sustaining Cooper's intensity so well and losing nothing to their more southerly colleagues. 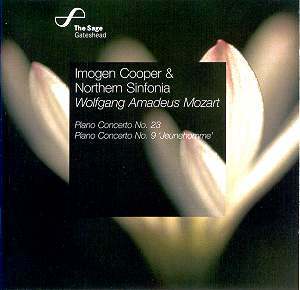 Cooper adds decorations to Mozart's large, bare intervals - towards the end, around six minutes in. The finale begins with Cooper opting for a completely different touch, a harder staccato that delineates the territory immediately. Again there seems to be very slight blurring from the middle frequencies of the orchestra, though. The so-called Jeunehomme Concerto begins with Cooper rather surprisingly indulging in unnecessary point-making in her initial dialogue with the orchestra. Just one misjudgement – an over-tenutoed note on the orchestra around 1:28 in. But with Cooper's pianistic re-entrance, all is civility and expert balance. Cooper even relaxes enough to give a really cheeky end to the cadenza. The middle Andantino is peppered with moments of magic; the finale contains large swathes of superbly even passagework, scampering around wonderfully. Perhaps Cooper milks the Menuet that forms the centrepiece of this finale rather, but one can still revel in the beauty of her phrasing. True, I still maintain much affection for Cooper's mentor, Alfred Brendel, in this piece - I refer to the earlier ASMF recording now on a Philips twofer - but Cooper's recording shall now ever be at its side. There is little doubt that this disc will bring much joy. The applause at the close of both concertos is eminently deserved.